Chelsea has a way of making everyday items and processes look super fabulous, and baby supplies are no exception. 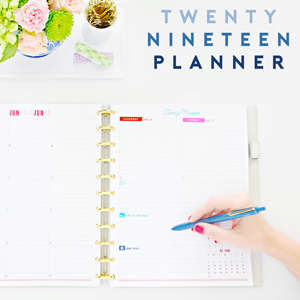 I always love checking in on her blog, Two Twenty One, for no-nonsense solutions to everything from laundry room storage to kitchen organization. Now that sweet baby Owen has arrived, I get both a frequent baby fixin' and organizational eye candy. 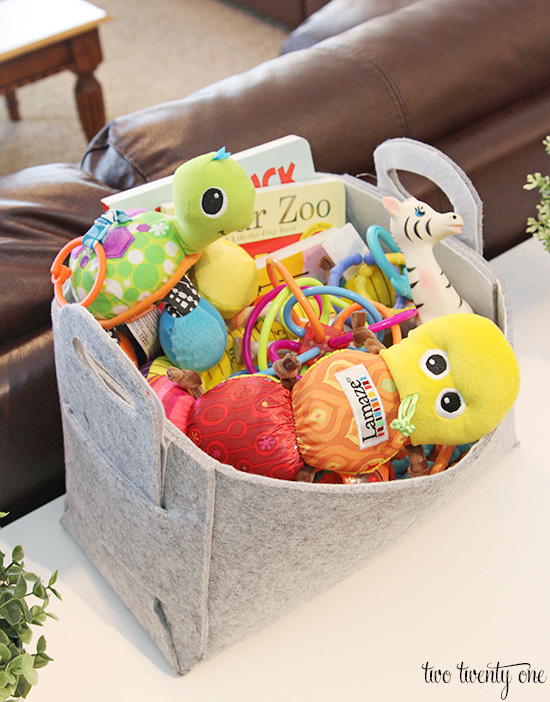 We are long past diapers and bouncers in our home, so it is nice having Chelsea stop by to share her tips for stashing daily baby belongings. Let's face it, typically, babies come with a lot of stuff-- whether it's stuff you buy or stuff you're given. 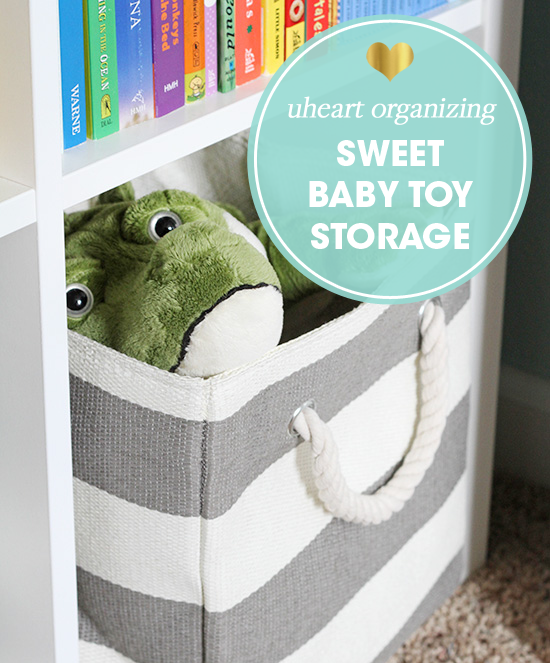 So today I'm sharing some baby toy storage ideas. 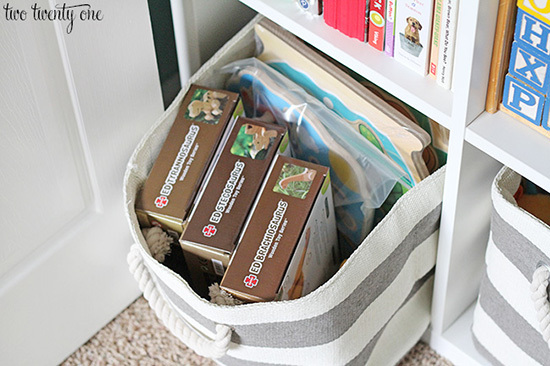 As you can see, books and some toys are stored in the top cubbies and more toys are in the fabric bins (from The Land of Nod) that easily slide in and out of the bottom cubbies, making for easy clean up. I put puzzles, which he won't be using for a while, in the bin to the far left. Toys he can play with when he was younger and now are in the second to the left bin. Bath toys and toys he can play with soon are in the second to the right bin. And Owen's small stuffed animal collection is in the far right bin. When Owen was younger, and not sitting up on his own, we would spent a lot of time holding him while sitting on the couch in our living room. So I put a basket of toys and books on our sofa table. 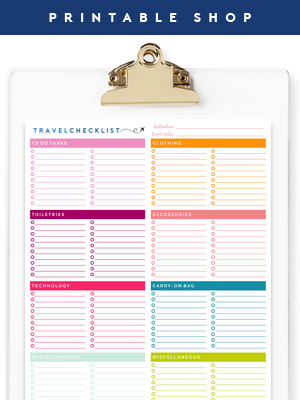 This made the items easily accessible and organized at the same time. Now that Owen is sitting up on his own and more mobile, we spend a lot of time playing on the floor with him. While I'd love a new coffee table with built-in storage, it's not really in our budget right now. Plus, I think coffee tables are the hardest pieces of furniture to shop for. So I make due with what we have for now, which is just a regular, four-legged coffee table (ahem) from my husband's college days. 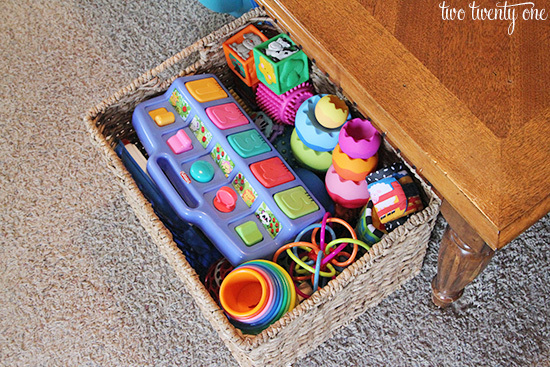 Larger toys that wouldn't fit in a basket very well are also stored under the coffee table. It's not the most attractive solution, but it keeps them out of the way when they aren't in use and mostly hidden. 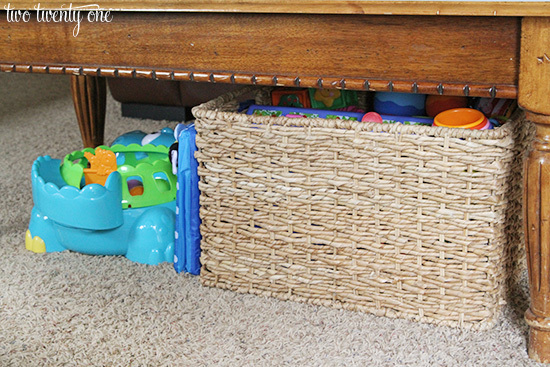 All of Owen's smaller toys are stored in a basket under the coffee table. When we want to get him a toy, we slide it out from under the table. And then we clean up for the night, we throw everything back in the basket and slide it under the table. 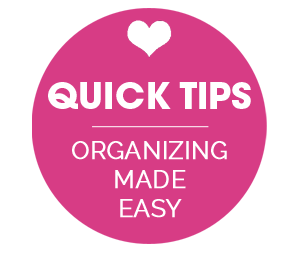 This makes cleaning up exceptionally quick and easy. We also use the basket to support Owen's sit-to-stand walker-- placing the basket behind the walker so the walker doesn't shift when he's pulling up and pushing on it while playing. Yay for basket double duty. And then there's the large toys that are hard to hide. We put those out of the way next to our dresser turned TV console. I've determined that when it comes to books and smaller toys that bins and baskets are your friends. 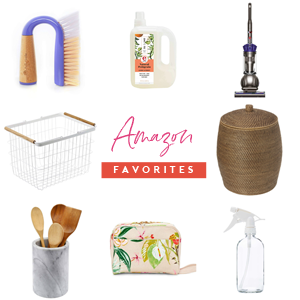 There's tons of options to fit with your home decor, and they allow for quick and easy clean up. I've also learned that having place for everything is important, like with Owen's nursery dresser. If you're an expectant or new momma looking for inspiration, you can check out all of my baby and nursery related posts here! Hey friends! I'm Chelsea from Two Twenty One! I'm a twenty-something living in Indiana with my husband, Brad, and our crazy mutt, Jack. My loves are photography, travel, DIY projects, baking, wine, sarcasm and my iPhone. The husband and I are attempting to make our home a little less cookie cutter and a lot more awesome. 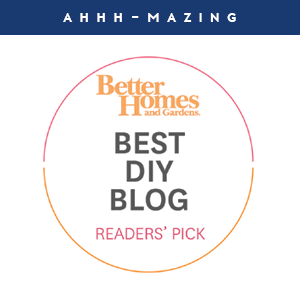 My little slice of the internet, Two Twenty One, is where I share my latest home improvement projects, furniture makeovers, crafts, recipes and home & seasonal decor ideas. I am beyond excited to join Jen and the rest of the IHeart Organizing team! Baskets are your friends! And it's amazing at how quickly those toys tripe then quadruple and then are out of control. I like to cycle a lot of mine in and out of rotation. So then baby girl thinks they are new! This is a brilliant idea, Kristin. I have friends who have done that at Christmastime. Their little ones were overwhelmed with an abundance of gifts so, to keep life interesting, they'd hide away some of the toys to bring out a few weeks later! Love this, I am inspired. Making use of the lower space in a closet is a great idea. So fun! This looks great! That is an amazing system to organise the toys. We use the boxes from Ikea. Thanks, Sheela! Isn't IKEA great? Thanks, Sinea! 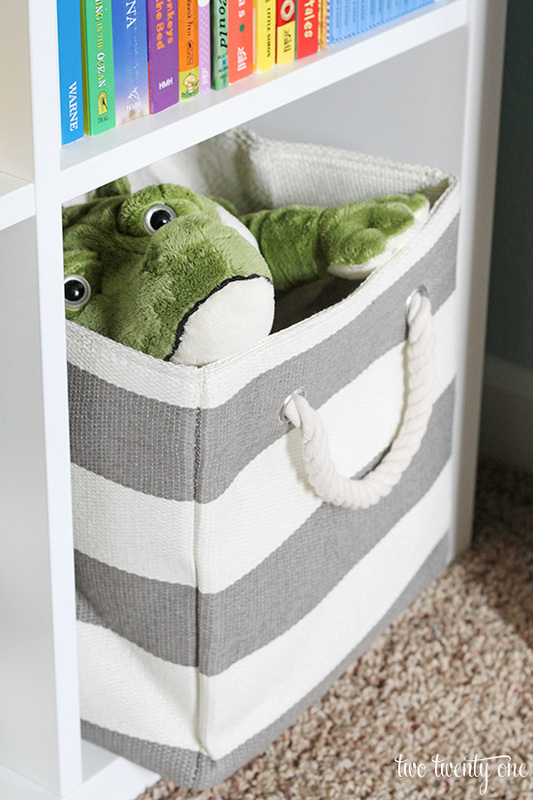 We LOVE those The Land of Nod baskets. I'm sure we'll have them around for years to come. I totally agree! For being such small beings they accumulate so much stuff. We love the Kallax and Hemnes. You can't beat the prices, and they're sturdy pieces of furniture. Great posts. Toys can really take over a home. 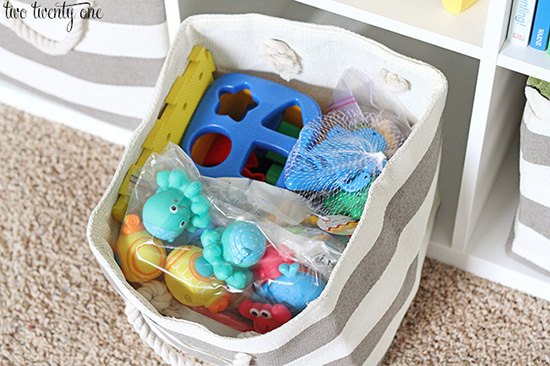 I use small bins in certain parts of the house to keep the number of toys to a manageable number although my kids seem to bring everything to one spot. Then I have to spread it out all over again. Thanks for Sharing. 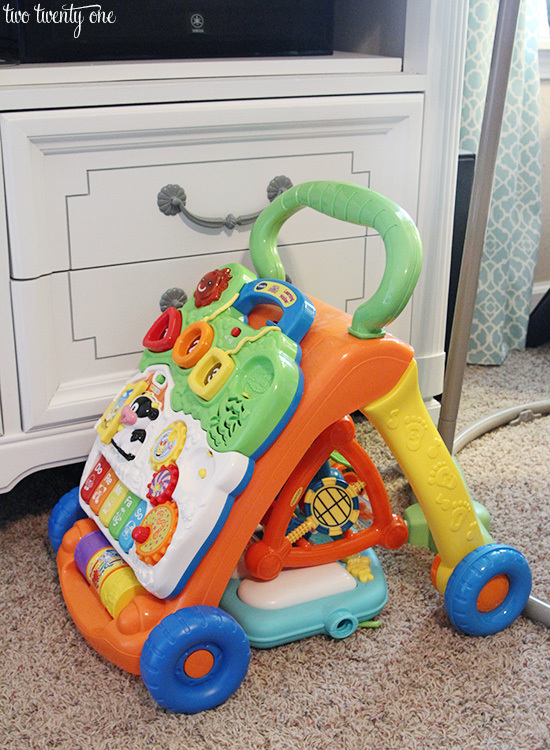 Have you tried rotating toys (swap out their toys every week) and limiting how many toys they have access to-- like one basket of toys per child? That way they don't get bored with the same toys all the time so they actually play with the toys instead of dumping them out. Totally practical! 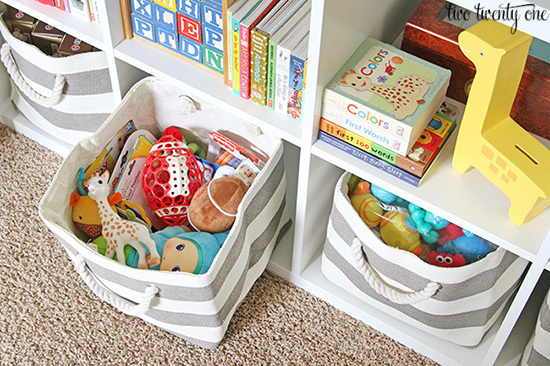 I always used baskets/bins when my kids were mobile and it was never an issue. Sure, a basket may have gotten dumped out, but it's easy clean up! My youngest in now 10 months and mobile and we use many of the solutions Chelsea displays in her post; no issues at all! Thanks, Jenny! Congrats on baby boy #3! I don't mean to sound mean, but this info is not really worth an entire post. Using bins to store kids toys is kind of the norm. I am sorry you feel that way. 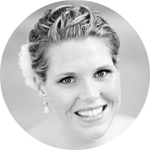 Not every post will inspire every reader, however, there are readers that did appreciate the post and have mentioned they will use Chelsea's tips within their own spaces. Although I also store my boy's toys in bins, seeing Chelsea's setup visually inspired me in other ways as well. xo! 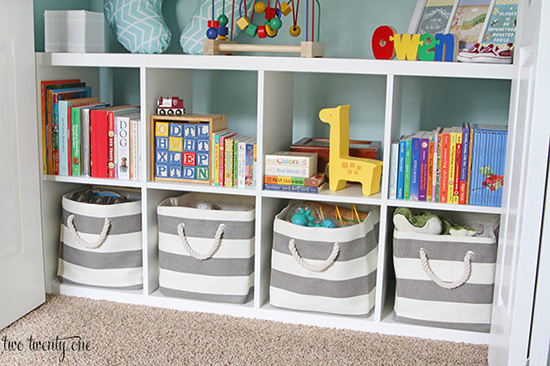 I love everything about this post; the book shelf, the stripy baskets, the nursery draw organisation. This post got me out of bed this morning, to finish off my blog post on my sock draw organisation at: http://organisingsmallspaces.blogspot.com/2015/04/sock-draw-organisers.html Thanks Jen! I LOVE using soft sided containers like you did. They are lighter for kids to move around if necessary and if they fall on them, there's no breakage or inquiry. I love how you made space for the toys and stuff, while keeping it pretty. LOVE this! Thanks, Bonnie! 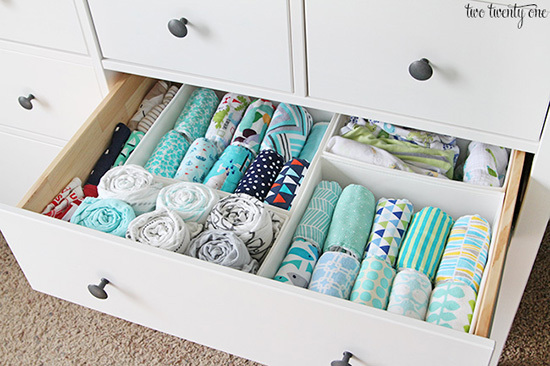 Aren't the fabric bins great?